Gran Stead’s Ginger Co is hosting an open day at Mile Oak Farm in Portslade on Saturday June 30. It's the perfect opportunity to learn about the making of their non alcoholic ginger-based products. Fans of all things ginger will soon have a chance to find out how this fiery ingredient is turned into an award-winning drink and to sample a range of ginger-based products. 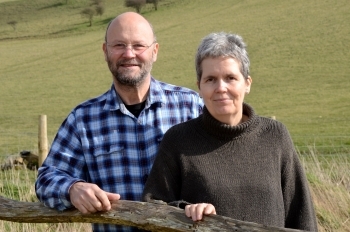 Gran Stead’s Ginger Co will open its doors to the public on Saturday June 30, and owners, Rosemary and Chris Knox, will be giving guided tours around their production facilities based at Mile Oak Farm in the Portslade area of Brighton and Hove city. Visitors will have a unique chance to see how the non-alcoholic Gran Stead’s Mellow Ginger drink or its Fiery version is made and bottled, and then enjoy some tastings of the full range. The tours take place during Mile Oak Farm’s popular bi-annual Open Day, which starts from 10am. Families can witness life on a working farm first hand, with sheep shearing, air rifle shooting, ferret racing, tractor and trailer rides, and much more. There will also be classic cars and a tractor and vintage machinery display. The event is free to attend and there's plenty of parking. Chris and Rosemary will be joined by representatives from Storrington-based Auntie Val's, makers of Gran Stead’s ginger jams and marmalades. Auntie Val's is a Community Interest Company run by volunteers to give people with disabilities the chance to work, either at its Storrington base, or within the wider business community. Every year the organisation supports around 60 people of all ages and with all disabilities. They are given work experience and training, producing small batches of delicious preserves, including the breakfast favourite, Root Ginger and Seville Orange Marmalade and jams such as Rhubarb and Ginger and Seriously Ginger. Gran Stead's Ginger Co produces unique soft drinks with a nostalgic nod to yesteryear. There are six traditional drinks in the Gran Stead's range: Mellow Ginger; Fiery Ginger; Still Lemonade; Still Lemonade with Zing; Blackcurrant with Zing; Spiced Ginger Punch.